Ask around, and it won't take long to get an earful from Granite Staters with opinions about our yearly car inspection – ranging from gripes to graciousness. “It has brought to my attention several things that I need to do with my vehicle that I was unaware of," says Barbara Barksdale, of Epsom. “Some of the mechanics in the garages – they’re either A, too picky, or B, they want to take the customer for a ride,” says Joe Bergeron, of Manchester, in between errands one recent afternoon. 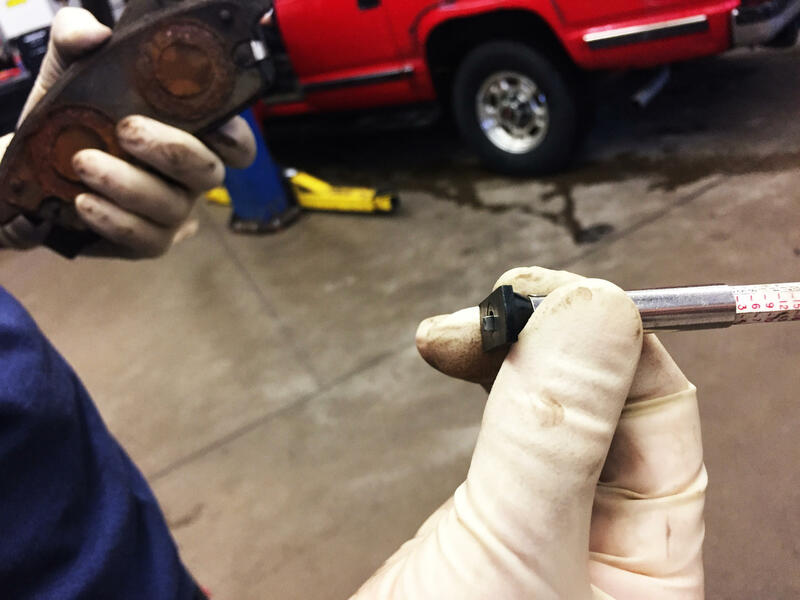 While New Hampshire's Division of Motor Vehicles oversees the annual inspection process, the inspections themselves are carried out by mechanics at more than 1,000 state-licensed inspection stations around the state. Our question-asker didn't want to be part of this story, and we're going to respect his privacy. But suffice it to say this Granite Stater, after an unpleasant experience where he felt he was asked to pay for unnecessary services during one recent car inspection, was skeptical. So, first thing: It’s actually more than half of states that lack an annual inspection. 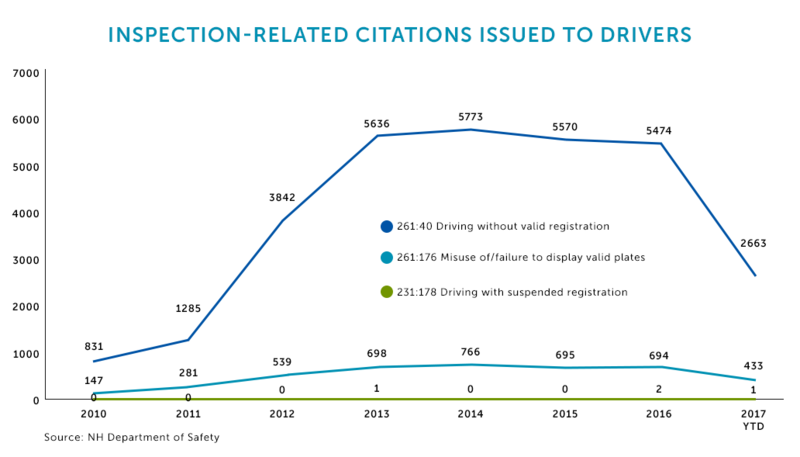 In the last few decades, a growing number of states have scrapped their annual inspection programs— deciding they’re too costly, too complicated or don’t seem to have a clear impact on road safety. New Hampshire is one of only about a dozen remaining states to still require safety inspections on most cars every year. So, thousands of times a month, at thousands of car dealerships, chain stores, and independent repair shops around the state, we put our cars through it. Dan Weed, owner of Weed Family Automotive in Concord, has been in the auto business for decades – and understands why some people might be skeptical of the practice. The way he sees it, regular vehicle safety inspections are like an annual physical for your health: It’s better to spend time on preventative maintenance than ending up paying for more costly emergency repairs later on. Plus, he says, they help prevent accidents. A mechanic at Weed Family Automotive in Concord shows the minimum tire thickness required to pass New Hampshire's safety inspection. Pete McNamara, with the New Hampshire Auto Dealers Association, points to data from the state showing that more than 75,000 cars fail each year for faulty brakes alone. “And when I say failed, it’s that they have less than a penny’s thickness when it comes to brake pad left,” McNamara added. So: Annual safety inspections are about safety. Sounds reasonable. But that’s all from the perspective of people in the auto industry. The New Hampshire Division of Motor Vehicles, within the Department of Safety, actually runs the program. So we tried to get an explanation from them – first reaching out to request an interview back in March. And then tried, and tried again. But the agency, for some reason, wouldn’t make anyone available for an interview. Eventually, after we asked once again this week in advance of the story’s final deadline, the DMV did offer to read a prepared statement over the phone. Listen to the DMV's full on-the-record statement about car inspections. In part, Department of Safety Spokesman Michael Todd said the inspection process “is focused on ensuring the vehicles on New Hampshire's roadways can be operated safely, so that when your son, your daughter or loved one takes the keys to go out for the evening, that the state inspected vehicle is safe for them and other travelers on the road.” He also noted that inspections are important because the state’s “unique seasonal changes and road conditions” can add to vehicle wear-and-tear. But Todd wouldn’t answer follow-up questions on tape. In lieu of an interview, the DMV did answer some additional questions via email – including, among other things, how much money the state makes from these annual inspections. You know those little inspection stickers you put on your front windshield? (The kind that Alexandria resident was trying to replicate with a cheese wrapper?) 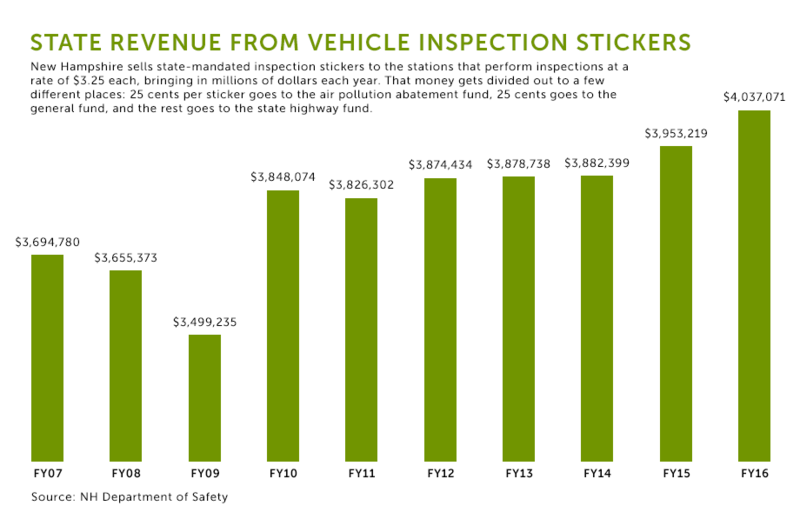 Licensed inspection stations have to buy those from the state – and last year alone, that brought in more than $4 million. Most of that money goes to the state highway fund. Some of it goes to fight air pollution, and some of it just goes back to the general fund. If the inspections weren’t yearly, the DMV said, hypothetically, the state would lose money. That law was first passed in 1931. It has, of course, changed a few times along the way – in fact, it went from requiring safety inspections twice a year to once a year in the 1980s. But New Hampshire’s not alone in being one of the last remaining states with an annual inspection requirement – and a state whose inspection laws date back to a time when people were still getting used to the whole car ownership thing, period. “Many of the states that still have it are some of the founding fathers,” says Susan Fleming, who worked on a 2015 report about state inspection programs for the U.S. Government Accountability Office. Fleming and her team analyzed studies, looked at crash data and interviewed officials in all the states with annual inspection requirements – well, all except for New Hampshire. (Sound familiar?) In any case, after all their research, the GAO’s findings about safety were inconclusive. “It’s pretty challenging to identify a causal link between these vehicle inspection programs and safety outcomes, using available accident data,” Fleming says. That doesn’t mean they don’t improve safety, she said – just that the evidence isn’t there to say, either way. Note: These statistics reflect only citations, not convictions. 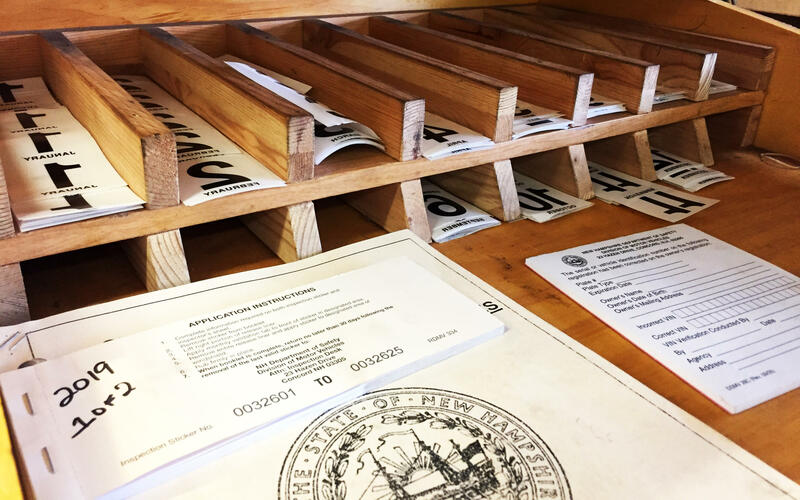 There have been a number of attempts to change New Hampshire’s inspection laws. In the last decade, at least five bills have been filed to move it to every other year — but none of those made it very far. So, for now, plan on still budgeting for that annual inspection. It is also worth noting that the DMV does play a watchdog role – inspecting the inspection stations, too. The agency says they most frequently punish stations for giving out stickers too freely to cars that shouldn’t pass safety inspections, and for “emissions tampering,” or reading the emission levels from a different car than the one being inspected. But that’s where I still have questions: How does that state oversight work? How do they decide what to investigate? And how often, if at all, are inspection stations found to be taking advantage of customers? Back at the auto shop in Concord, Dan Weed says New Hampshire drivers should feel empowered knowing they do at least have choices – and a little bit of homework can help avoid paying for repairs you don’t really need. “If there’s any question, get a second opinion,” he advises. And if you still have questions, you could call the DMV’s public hotline. Maybe you’ll have more luck than we did. Update: Thanks to all who weighed in! More than 400 of you cast your votes, and we'll let have more details soon on the winning question and our plans from here. In the meantime, make sure to keep sending your questions our way here.